Every Wednesday brings a guest presider with a normally brief presentation during and after dinner. This week was an opportunity to get a better look at the Church of Rome, from some excellent authorities. 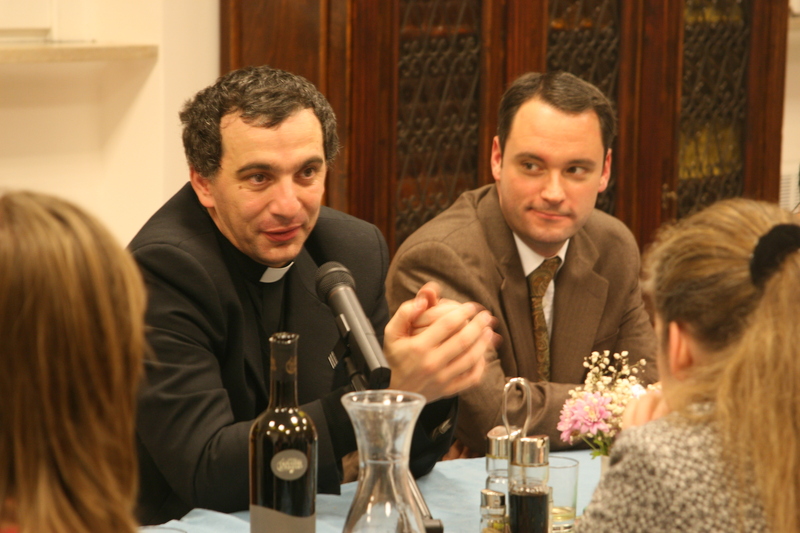 Our presider was Don Nicola Filippi, ordained a presbyter of the diocese of Rome in 1995 and named a Chaplain of His Holiness (the lowest grade entitled “Monsignor”) in 2005, he serves as secretary to the Cardinal-Vicar of Rome, Agostino Vallini. 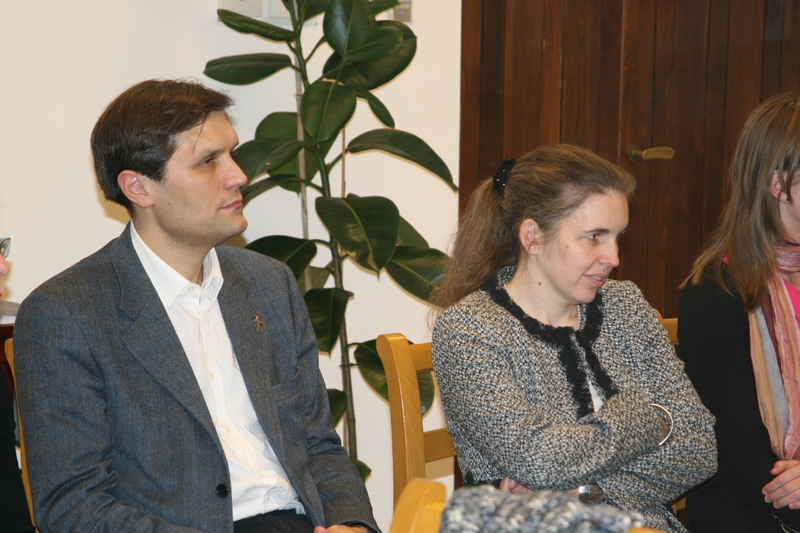 Princess Gesine and her husband, Deacon Masimilliano, of the Doria Pamphilj family, joined us as well. Don Masimilliano and Donna Gesine are friends of the Lay Centre and were our generous guides when we visited the family palazzo/galleria last month. Vested for the liturgy, Don Nicola is the very image of a classical Roman senator, and I think will be a bishop himself in the next decade. Two interesting liturgical observations: there are very few deacons in Italy, I think Masimilliano is one of only two in the suburbicarian diocese where he is incardinated, so it was clear there is room for a more robust development of their role. Also, since communion under both species is not as common in Italy as it is most places in Europe and North America, Monsignor Filippi chose to serve communion by intinction, I think as a kind of pastoral compromise between his custom and ours, which was a first for me. The Church of Rome, the diocese itself, is an interesting reality. Their diocesan bishop is the pope, and yet, as Father Nicola said, “Rome is Rome, and the Vatican is something else entirely. That’s the other side of the Tiber.” Some of the pastoral and administrative issues sound not all that different from home!. Compare that to Seattle, with 578,000 Catholics, including 3 bishops, 294 diocesan clergy, 32 clergy from other dioceses, 96 religious clergy, 486 lay religious, about 800 lay ecclesial ministers and 1393 lay teachers. Rome has less than 5 times as many Catholics, but more than 21 times as many clergy, and half as many lay staff*. *Lay staff listed for Rome included faculty of the pontifical universities, members of commissions and consultors to dicasteries, as well as actual paid staff in Roman offices – virtually no lay ecclesial ministers as we know them in the States. Only about 40%-50% of the children born in Rome are recorded as being baptized, and there are only about 80 or 90 catechumens each year, though Fr. Nicola indicated that a large number of families may take their children outside the city, and thus to other dioceses, for baptism so it may not be quite as low as that looks. He spoke about a questionnaire the chancery had been trying to get parishes to fill out regarding pastoral planning, evangelization and sacramental life, and only about 2/3 of parishes responded (I thought this was pretty good, actually). When the Cardinal started visiting pastors who had not sent the response in, one of the first said, “oh, yeah, we forgot about that. I’m sure it’s here somewhere…” and then proceeded to produce the previous year’s questionnaire, still in the original envelope. As I am sure you have heard, though Italy is nominally 90% Catholic, very few people are very active in the life of the church. For most, it is where you go to get baptized, married, and buried. Just last night a classmate was telling me how, on his first Christmas in Rome, he attended a popular parish nearby and could not find a seat 20 minutes before mass began, and the church was filled with young people. But then, as the opening hymn began, mobile phones came out of pockets to take pictures and he heard several people calling their mothers, “yes, mama, I’m going to church. See, I’m sending you a picture!” Then they left. By the time of the opening prayer, my friend had no problem finding a seat. One of the responses that has been very popular in Italy, and in Rome especially, are the lay movements. Whereas the U.S. has seen a greater development in the area of parish life and in lay ecclesial ministry, here there is almost the sense that if you are really serious about your faith you do not go to your parish but spend your time with the movement. 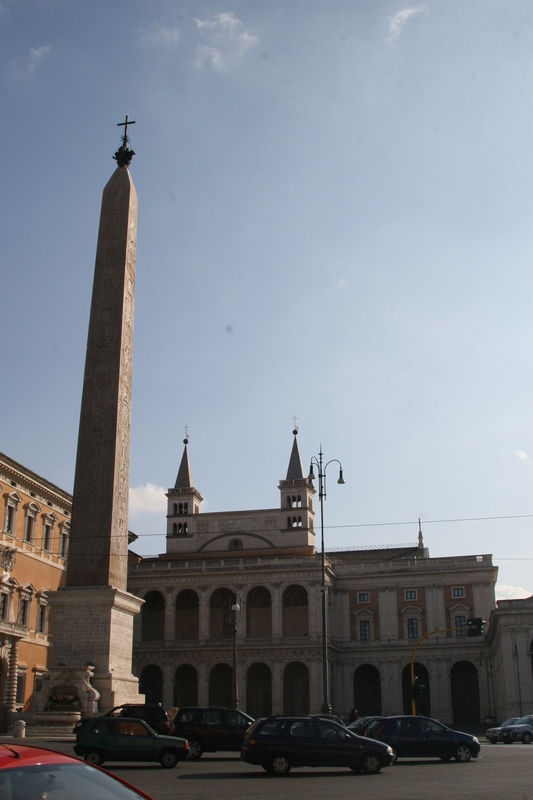 Two of the largest in Rome are the Charismatic movement and the Neochatechumenate Way. (I would have guessed Sant’Egidio, Focolare, or Communione e Liberazione). Unfortunately, some of the biggest problems for the Catholic Church of Rome come from these movements. Poor catechesis, insufficient theological education of the clergy, and the creation of a parallel church to the diocesan-parish structures were all cited as serious issues among the diocesan leadership. The dichotomy of spirituality and theology, so typical of the “classical” western Latin tradition, is noted especially in the Neocatechumate Way with an emphasis on the spiritual and too little attention on the theological. They are also having a challenge with the high number of non-Italian priests coming to serve the communities here, without adequate cultural formation and preparation for the life of the Church in Rome. This was one more reminder of how slowly my Italian is coming, too, so prayers for that please! I would like to have asked about lay ecclesial ministry in Rome. Next time! By A.J. Boyd in La vita Roma on November 18, 2009 . Could you please detail the problems caused by Communion & Liberation. I would like to understand them better because I have heard that Pope Benedict XVI is involved with them.